Private equity firm 3i Group P.L.C., with a strong foundation in Europe and elsewhere, plans to purchase the company and its three operating businesses—Qure Medical, QSR, and Quadra Tooling and Automation—from Industrial Growth Partners for an estimated $160 million. Both 3i and Q Holding have a common goal of expanding in a number of regions. The transaction, which is subject to standard regulatory approvals, is expected to close in mid to late December. Q Holding President and CEO Randy Ross said the company's management team and work force of about 1,100 will remain intact. The firm operates six manufacturing facilities in the U.S. and China, selling products in more than 50 countries, and has a sales and engineering office in Germany. Q Holding primarily serves the automotive, medical and pharmaceutical markets with goods made by Qure Medical and QSR. 3i is a leading international investment manager based in England and is well known throughout Europe where it has had a strong base since the 1940s, Ross said. With its expertise and contacts in Europe, 3i will be able to help Q Holding navigate in its bid to grow further in Europe, he said. A good portion of that growth is expected to be organic driven by the creation of new or improved products, he added, but some could come via acquisitions. “I see this (acquisition) as a benefit to us in order to find the right platform for us as we expand in Europe,” according to Ross. Relyea agreed, noting that in addition to organic growth, selective acquisitions in Europe and North America within the fragmented silicone molding sector would benefit Q Holding. Any acquisitions would have to fit well with the companies within the Q Holding operation, he cautioned. 3i can help the company in that department and has a bank of contacts in Europe, which made it a good match for Q Holding, he said, adding that 3i reached out to him and proactively courted the company because of its growth potential. Q Holding has strong representation in NAFTA countries and in China, he said. And its sales and engineering office in Germany is a good beginning for the company in Europe. Its next logical step is to put a manufacturing operation in place in Europe, Ross said. 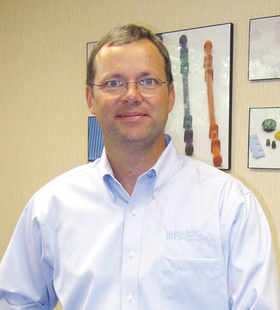 Both QSR—a maker of automotive, industrial and aerospace rubber goods, such as connector seals and ignition insulators—and Qure Medical—a producer of elastomeric products, including catheters and syringe plungers, for the medical and pharmaceutical industries—can operate out of the same facility, he said. But that's down the road. Right now, Ross said he's happy with the company's present position and looking forward to the development of new products that will help Q Holding's operations grow. 3i will be the third private equity owner in the last 21/2 for the businesses that make up Q Holding. The then-named Quality Synthetic Rubber Inc. was owned for five years by Cleveland-based Blue Point Capital Partners L.L.C. until Industrial Growth Partners—along with its portfolio firm Lexington Precision Corp.—bought QSR in mid-2012. As part of the integration process, the group scrapped the Lexington name from the business and replaced it with names all tied to the letter “Q.” QSR has operations in Twinsburg; Jasper, Ga.; and Dong Guan, China. Qure Medical oversees facilities in Sturtevant, Wis.; Rock Hill, S.C.; and a plant opened earlier this year in Dong Guan. And Quadra Tooling & Accessories supports those businesses by developing the proper molds and processes. Its main location is in North Canton, Ohio, but it also does work at Sturtevant.